Upcoming World Expo in 2020, government initiatives such as Dubai Plan 2021 and Abu Dhabi Vision 2030 are some of the key factors driving the construction industry in UAE. These developments have resulted in the expansion of metros & airports, construction of new hotels & shopping malls, increasing infrastructure spending coupled with construction of new residential units which are further driving the air conditioners market in the country. According to 6Wresearch, UAE's Air Conditioner market is projected to grow at a CAGR of 6.1% during 2016-22. 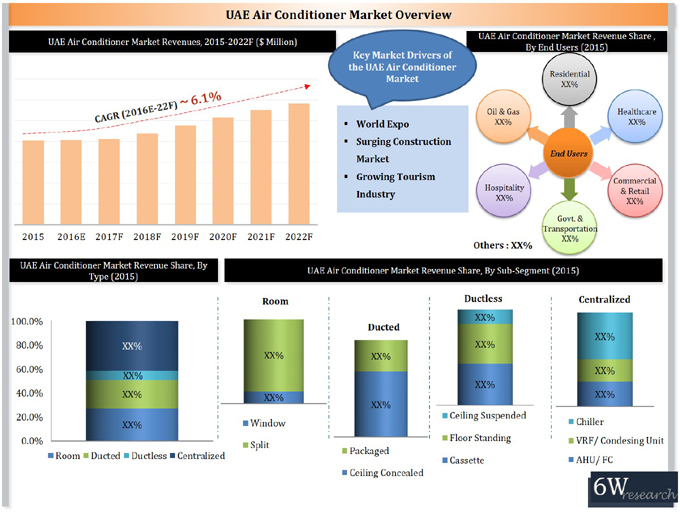 In the UAE air conditioner market, centralized AC segment accounted for highest revenue share in 2015. However, ducted AC segment is expected to record significant growth during 2016-22. Further, in the room AC segment, the window AC sub-segment is expected to decline over the next few years due to increasing demand for split ACs. Amongst all the verticals, the residential vertical generated the largest share in the UAE air conditioner market and is likely maintain its market leadership throughout the forecast period. The air conditioner market in the hospitality sector is expected to expand owing to the construction of new hotels due to anticipated surge in number of tourists and visitors for Dubai Expo 2020. The report thoroughly covers the air conditioners market by types, by segments and by regions. The report provides the unbiased and detailed analysis of the on-going trends, opportunities/ high growth areas, market drivers, which would help the stakeholders to decide and align their market strategies according to the current and future market dynamics. 14.3 GREE Electric Appliances Inc.
14.6 Midea Group Co. Ltd.
14.8 S.K.M. Air Conditioning L.L.C.